There are many pest control myths out there; some of them may even make an infestation worse. Myth #1. Pests don’t come into clean homes. While keeping your home clean can certainly help to keep some pests at bay, some of the most destructive pests, like carpenter ants and termites, are equal opportunity infesters, regardless of how clean or messy your home may be. Bed bugs are another common pest that will infest even the cleanest homes. The moral of the story is that, even if your home is spotless, it doesn’t mean you are immune to pest problems. Myth #2. If you have a cat, you never have to worry about rodents. Whether you grew up on Tom and Jerry or you watched any amount of Looney Toons as a kid, you probably already know that cats love to chase mice. However, not all domestic cats are interested in being your rodent exterminator. Some domestic cats may not see rodents as a threat, and the ones that do chase rodents aren’t always able to catch them. Rodents have been around for millions of years, and they have perfected the art of staying out of sight. They are also small enough to travel in places your cat cannot reach. Not only are domestic cats not typically good exterminators, but cat food can actually attract more rodents to your home, so if you have a cat solely for the purpose of rodent control, you may want to rethink your strategy. Myth #3. Keep mosquitoes at bay with a bug zapper. Summer is well on its way, and with it, will come a horde of mosquitoes, just waiting to feed on your blood and leave you with itchy, red bumps. The good news is that you are not helpless to mosquitoes, and there are steps you can take to keep mosquitoes off of your property. The bad news is that installing a bug zapper on your back porch is not an effective mosquito-prevention tactic. A study conducted by Notre Dame University found that only about four to six percent of the bugs found in bug zappers were actually mosquitoes. The same study also found that people who have these bug zappers in their yard actually get bitten by mosquitoes 10 percent more. This is because the zappers effectively attract mosquitoes, but they aren’t so effective at actually killing them. Myth #4. Daddy Longlegs are poisonous spiders. Have you ever heard that daddy longlegs are one of the most poisonous types of spiders, but their fangs are too small to actually harm a human? If so, you’re not alone. This has to be one of the most common myths about pests, and it has been around for ages. But the truth is that daddy longlegs aren’t poisonous at all, nor are they even spiders. Daddy longlegs are arachnids, but they are closer to scorpions than to spiders. They have a single pair of eyes, and they don’t produce silk. They don’t even have fangs! Myth #5. You should always use cheese in a mousetrap. This is another myth that we can blame on Tom and Jerry, and you might be surprised to learn that cheese isn’t necessarily the best option to attract mice and other rodents. Mice are most attracted to food that is high in sugar, so you’d be better off using sugar cubes, pieces of cereal or even peanut butter to lure them into a mouse trap. It’s also important to note that a mousetrap may not be the best option, especially if your have pets or small children in your home. These traps can easily be triggered by kids or pets, and it’s a much more effective solution to address the root of the problem rather than attempting to handle it one mouse at a time. The internet has made it possible for us to do many things ourselves that we once solely relied on professionals for, but pest control should not be one of them. 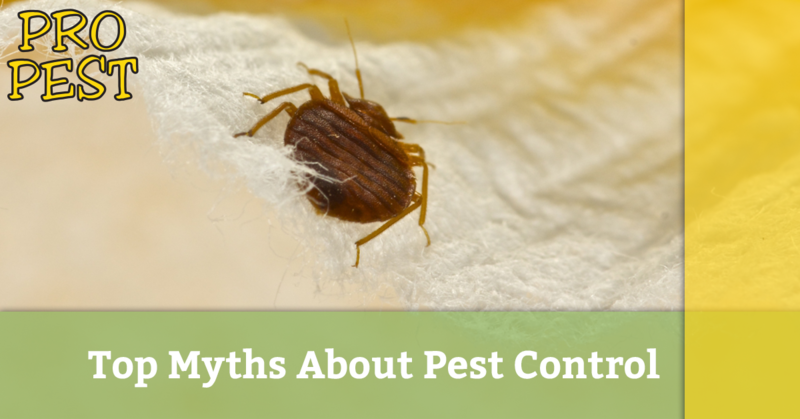 These are just a few of the many pest control myths out there; don’t waste your time trying to sort out what is true and what isn’t. Instead, turn to the best exterminator near you in Sealy by turning to Pro Pest Bugs. Schedule your free pest inspection today.